Like many in the Northeast and Midwest of the United States, I’ve been holed up at home lately, thanks to a big winter storm last week – and now – the polar vortex. Last week, we had over a foot of snow in Albany, New York, with some of the surrounding areas blanketed by up to two feet. The day after the storm brought even colder and gustier weather, with the windchill dipping down into the negative double digits. And this week has brought more of the same, but even colder. Needless to say, it’s been perfect weather for staying indoors for some feeder-watching, and not much else. Preferably with a warming glass of wine in hand, too – especially after coming in from shoveling the walks. In his The Crossley ID Guide: Eastern Birds, Richard Crossley describes the bill of the White-breasted Nuthatch (Sitta carolinensis) as “dagger-like”. 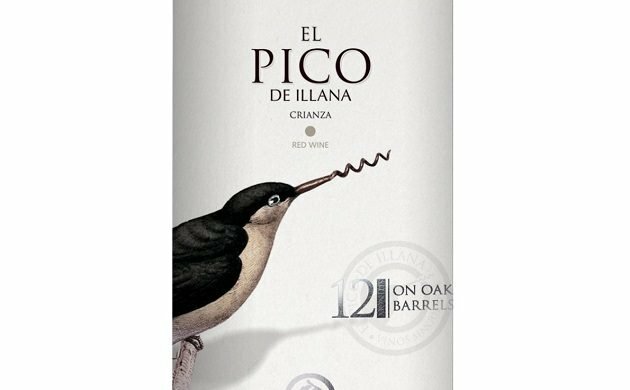 A slight exaggeration, to be sure, but it’s nothing compared to the straight-out-of-Hieronymous-Bosch fantasy of a corkscrew-beaked nuthatch presented on the label of this week’s wine: El Pico, a crianza from the Castilian winery Bodegas Illana. El pico, of course, means “the beak” in Spanish (as in the pico de gallo of Mexican cuisine). Out of curiosity, I looked up the Spanish word for “corkscrew” – sacacorchos – which is even more fun to say, but makes for more than a mouthful as a name for a wine. El Pico it is. In any case, this helix-beaked nuthatch is seriously equipped and looks like it means business – if that business is opening bottles of wine (and what else can one do with a sacacorchos?). While I had a lovely pair of White-breasted Nuthatches to watch while I enjoyed a glass of this wine, I was left to my own devices when it came to opening the bottle: my birds were much more interested in the frozen blocks of suet hanging in my backyard than in any bottle opening duties. With my hands still numbed by the cold, I really could’ve used some help in this, but alas, no corkscrew nuthatches visited my feeders that day. While stuck indoors and enjoying this wine, I spent far too much time contemplating whether or not the Corkscrew Nuthatch can open its pico, or if its odd, prosthetic corkscrew fuses the upper and lower mandibles together. In a few more weeks it’ll be spring and I’ll be outside birding, rather than pondering such things. Crianza is a Spanish term for a wine that has spent a year aging in oak barrels. Bodegas Illana grows seven varieties of grapes but only the best three are chosen each year to make their crianza. In 2016 – the vintage of this week’s wine – these grapes were Petit Verdot, Merlot, and Syrah, blended to a proportion of 43%, 32%, and 25%, respectively. The long aging of this deep crimson wine is evident in the bouquet and the palate, making it a warming and robustly oaky choice for a cold winter afternoon. 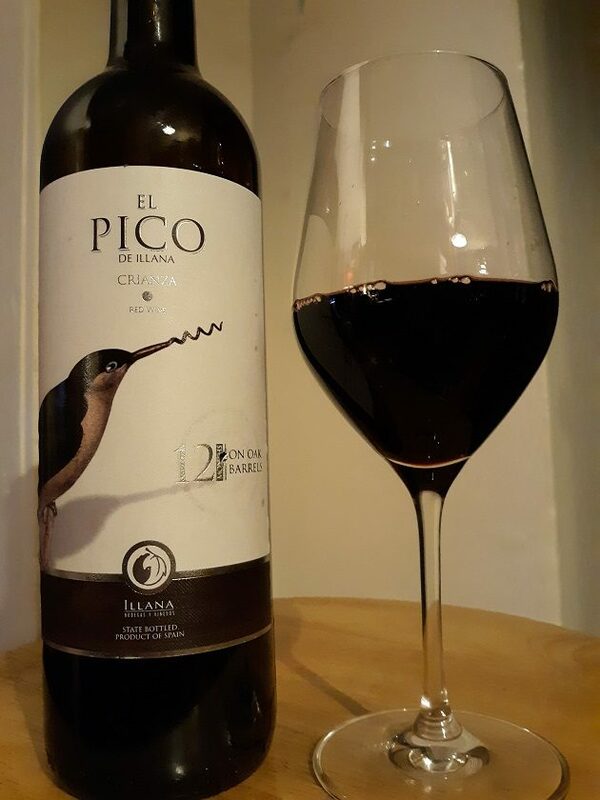 But there’s enough dark fruit – mostly black cherry – to balance it out, and the year this wine spent in the barrel does wonders in softening the bite of El Pico, yielding a dry but mellow red that’s hearty without being overbearing. Good birding – if you dare go out – and happy drinking!